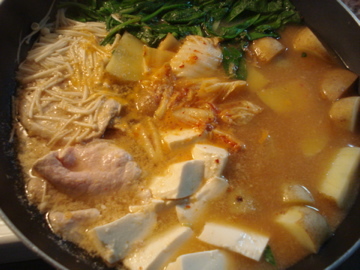 In Japan,we eat “Nabe Ryori” a lot of times specially in winter. My dictionary said ,”Nabe Ryori” in English is “A dish cooked in a pot at the table “. But I hadn’t eaten it sice I came here,I missed it so much. So today I decided to make it!! After shcool, I went to Korean town to get these things. 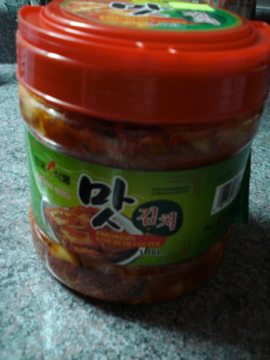 I was sure that I could get a good one,because it’s Korean town!! 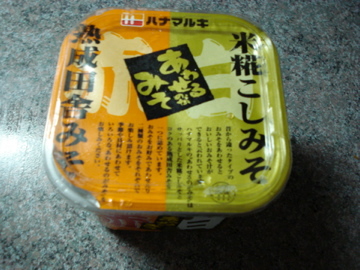 As you know, Miso soup is made with this. And I bought meat, spinach, tofu,and one kind of mushroom. Usually we use a pot to make this kind of dish, but I couldn’t find in my house. I’m a woman!! I have to learn!! uuuu, You are a cooker! nice! You can make good Spanish food,can’t you? wao! You cooked “nabe” ! It makes me warm too! I love “chige nabe”! I want to eat Nabe with everybody together surrounding a table! It must be so much fun !! Hahaha…Yeah, you have to learn!! I really want to eat!! It’s so easy to make!! I like “Chige Nabe” too!! I don’t know why but I like Korean food so much.